Mumbai, Aug 16 (IANS) The key Indian equity indices on Wednesday surged to provisionally close on a higher note as broadly positive global cues, coupled with intense buying activities in automobile, banking and FMCG stocks, lifted investors’ sentiments. Market observers opined that healthy buying witnessed in index heavyweights such as ITC, Tata Motors, Cipla and Hindustan Unilever, among others, pushed the equity indices higher. 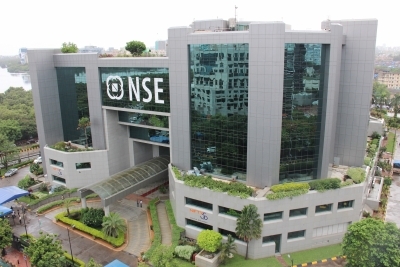 The Nifty50 of the National Stock Exchange (NSE), which reclaimed the psychologically important 9,900-level intra-day by touching a high of 9,903.95 points, provisionally closed at 9,897.30 points (at 3.30 p.m.) — up 103.15 points or 1.05 per cent. The 30-scrip Sensitive Index (Sensex) of the BSE, which opened at 31,566.24 points, closed at 31,770.89 points — up 321.86 points, or 1.02 per cent, from its previous close at 31,449.03 points. The Sensex touched a high of 31,805.99 points and a low of 31,399.35 points during the intra-day trade. The BSE market breadth was bullish with 1,646 advances and 942 declines.